Dr Irene Zempi is a Lecturer in Criminology at Nottingham Trent University. Irene joined Nottingham Trent University as a Lecturer in Criminology in September 2015. Prior to this position, Irene worked as a Teaching Fellow in the Department of Criminology at the University of Leicester for five years. She has a PhD in Criminology and an MSc in Criminology from the University of Leicester, and a BSc in Sociology from Panteion University of Social and Political Sciences in Athens, Greece. As a practitioner, Irene has extensive experience working with victims of hate crime, domestic violence, volume crime and anti-social behaviour at Victim Support in Leicester. Irene's research interests include hate crime, racism, victimisation and qualitative research methods. For her doctoral research, Irene examined the topic of Islamophobia and the targeted victimisation of Muslim women who wear the niqab (face veil). The study included individual and focus group interviews with niqab-wearing women at mosques, Muslim schools and Islamic centres, as well as an ethnographic approach whereby Irene wore the full veil in public. This study was the first to examine the experiences of women wearing the niqab as victims of anti-Muslim hate crime in the UK and therefore is an important piece of work in the field of hate crime studies. 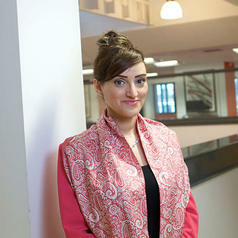 Irene has published widely on issues of Islamophobia and anti-Muslim hate crime. Her most recent project involves the first ever study to examine both online and offline experiences of anti-Muslim hate crime of ‘visible' Muslim men and women in the UK, with Dr Imran Awan from Birmingham City University. This study was commissioned and funded by the Measuring Anti-Muslim Attacks (Tell MAMA) Project.